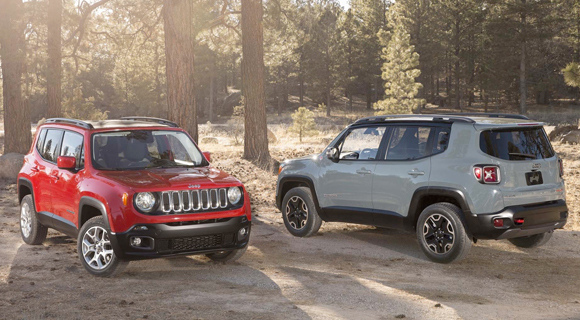 The all-new 2015 Jeep® Renegade expands the brand’s vehicle lineup, entering the growing small sport-utility vehicle (SUV) segment, while staying true to the adventurous lifestyle and 4×4 capability Jeep is known for. Renegade delivers a unique combination of best-in-class offroad capability, open-air freedom and convenience, a segment-first nine-speed automatic transmission that contributes to outstanding onroad and off-road driving dynamics, two fuel-efficient engines, worldclass refinement, and a host of innovative safety and advanced technology offerings. The result is an efficient vehicle created to attract youthful and adventurous customers around the world to the Jeep brand. Innovation is also at the forefront of any new Jeep vehicle, and the Renegade features the segment’s first disconnecting rear axle and power take-off unit (PTU) – all to provide Jeep Renegade 4×4 models with enhanced fuel economy. Jeep Active Drive and Active Drive Low 4×4 systems instantly engage when 4×4 traction is needed. Both Jeep Active Drive and Active Drive Low 4×4 systems include the Jeep Selec-Terrain system, providing up to five modes (Auto, Snow, Sand and Mud modes, plus exclusive Rock mode on the Trailhawk model) for the best fourwheel- drive performance on- or offroad and in any weather condition. From the start, Jeep designers knew the Renegade would need to deliver best-in-class offroad capability with city-sized proportions that exuded the brand’s rugged style while at the same time enhancing versatility, maneuverability and style. Additionally, designers were tasked to create an all-new SUV that would symbolize the Jeep brand’s renowned American design and ingenuity, as it would mark the brand’s first entry into the small SUV segment in more than 100 markets around the globe. Last, Renegade had to offer the open-air freedom that dates back to its 1941 roots, with the Willys MB Jeep. The result is the all-new 2015 Renegade, a vehicle that builds on the Jeep Wrangler’s powerful stance, and features fresh new styling with rugged body forms and aggressive proportions, which enable best-in-class approach and departure angles purposely designed to deliver best-in-class offroad capability. And for segment exclusive panoramic views, two available “My Sky” open-air roof panel systems conveniently stow to provide passengers open-air freedom with ease. The interior of the all-new 2015 Jeep Renegade has a distinctive form language, which Jeep designers have titled “Tek-Tonic.” This new design theme is defined by the intersections of soft and tactile forms with rugged and functional details. Major surfaces, such as the sculpted soft-touch instrument panel, are intersected with bold functional elements like the passenger grab handle – indispensable for off-road adventures and borrowed from its big brother, the legendary Jeep Wrangler. Unique “protective clamp fasteners,” anodized design accents and inspired colors are derived from extreme sports equipment, while the newly familiar “X” shapes inspired by its roof and tail lamps add to Renegade’s Tek-Tonic interior look. And to make sure all of the needed passenger gear fits, the Renegade is designed with an efficient and flexible interior package that includes a fold-forward front-passenger seat and class exclusive removable, reversible and height-adjustable cargo floor panel. With its fully independent suspension, capable of up to 8.1 inches (205 mm) of wheel articulation and 8.7 inches (220 mm) of ground clearance (Trailhawk model), Renegade raises the bar in the small SUV segment with best-in-class offroad capability. Extensive use of advanced steels, composites and advanced computer-impact simulations enable the all-new 2015 Renegade’s architecture to deliver world-class torsional stiffness and the Jeep brand’s durability required for Trail Rated adventures.